Last night I watched Korean film, I'm a Cyborg But That's Okay (ha ha funny title I know) and it made me think about all of these creative cultures that we're surrounded by and that so much is still out there waiting to be explored. I really live for this, I love exploring and finding things that I've not seen/heard or experienced in some way before. This led me to think of the beautiful illustrative works I've noticed coming out of Korea over the years and how beautiful and original they really are. Then I recalled a Korean Flickr contact of mine, Chun Eunsil, and thought I'd share her work with you today. Chun illustrates children's books (I love how she illustrates classic German fairy tales) and has a line of stationery and other products like calendars and iPhone skins that you can see on her darling website. 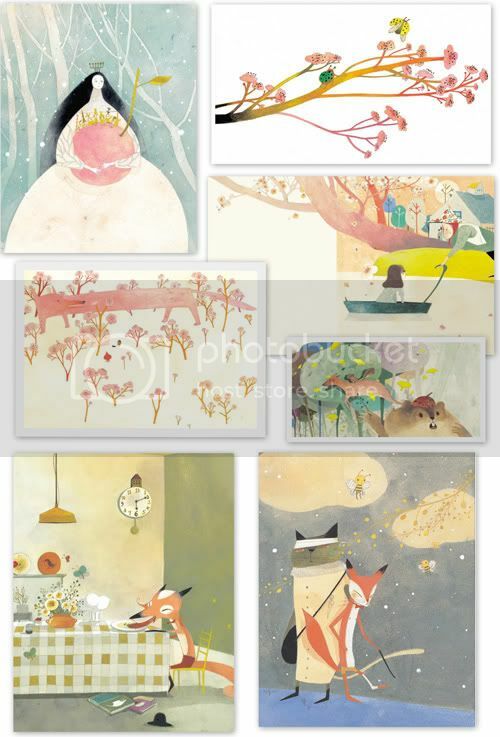 These images put me in such a good mood... the soft colors and detail of her work is quite magical... I can imagine little children loving her books. I wish I had access to a Korean bookstore where I could find her books and similar illustrations. I once collected foreign language children's books, in fact I have the cutest Winnie The Pooh in Russian that is also illustrated by a Russian artist that I held onto for years. It helped me when I was studying Russian in Cambridge in '98. I was dating this guy from Los Angeles who wanted me to run away with him to live in Moldova and I almost went, so I studied Russian and nearly ran off with him but.... didn't... And thank goodness for that because he turned out to be a bit of a nutcase! Ha! But often nutcases can be the best men to date (temporarily at least) for the sheer emotional explosion of it all -- their often wild, eccentric, unplanned, no rules lifestyle can be a springboard to things you'd not explored had you never been exposed/heart broken by such a wacky person. That whirlwind romance helped me to learn some Russian and though I never became fluent, I still learned a lot about Russian life and culture and am fascinated by it still. It also helped me to better connect to some of the letters and postcards that I remember my aunt sending to me when I was a child. She lived in many parts of the world during her lifetime and was living in Russia once where she learned to speak the language fluently. She would often send me beautiful books that I sadly no longer have, and when I studied Russian myself it reminded me of those books so I went on a wild search for Russian children's books and found a few gems. I should show you the Winnie The Pooh book sometime. Very cute. But yes, I love foreign language children's books despite the fact that I cannot understand most of them. The German ones are lovely and I understand those, as my language skills are better than before and so my collection of German children's books help me tremendously. Have you ever flipped through Japanese and Korean books for kids? Oh my goodness, they nearly make my heart explode from the cuteness, and oh yes, French books are just the best too. Now that I think of it though, I've never in my life spotted a book for kids from India. I need to google that one. Ha, my head is all over the place today. Sorry for that, I'm thinking out loud a bit. I have a lot going on in my life right now and I'm overstimulated from it all so my brain is buzzing and gushing stuff out left and right. My poor husband, as he has to listen to be babble on all day... It's a good Friday feeling to have (at least for me) as I know I'll get some decorating projects done at home this weekend as a result of this over-stimulation and explosion of ideas. What about you, do you have any projects planned for this weekend? Do check out Chun Eunsil today, I know you'll love her website and Flickr stream.